충청남도 홍성군 용봉산에 있는 불상으로 돌출된 바위면을 파서 불상이 들어앉을 공간을 만들고 그 안에 돋을새김으로 높이 4m의 거대한 불상을 만들었다. 민머리 위에는 상투 모양의 머리묶음이 큼직하다. 얼굴은 몸에 비해 크고 풍만하며, 잔잔한 미소가 흘러 온화한 인상을 풍기고 있다. 양 어깨를 감싸고 있는 옷은 목 밑에서는 굵직한 몇가닥의 선으로 표현되었지만 아래쪽은 가느다란 선으로 도식화되었다. 부처의 몸에서 나오는 빛을 형상화한 광배(光背)는 파낸 바위면을 이용해 희미한 음각선으로 윤곽만을 나타냈다. 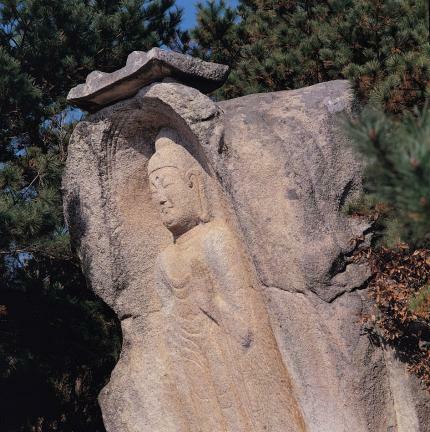 전체적으로 얼굴 윗부분은 입체감이 있고 원만한데 비해 아래로 내려갈수록 양감이 약해져 균형이 깨지고 있는 작품으로 고려 초기에 만들어진 것으로 추정된다. 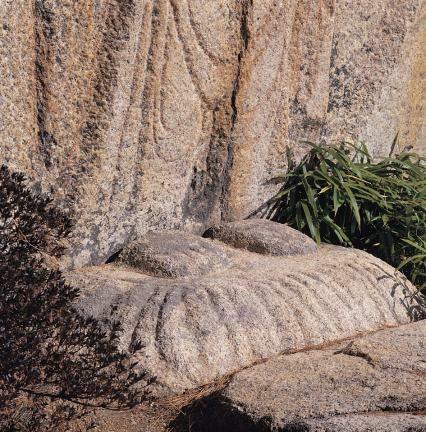 This is a large statue of Buddha engraved on a protruding rock carved into the shape of a shrine. 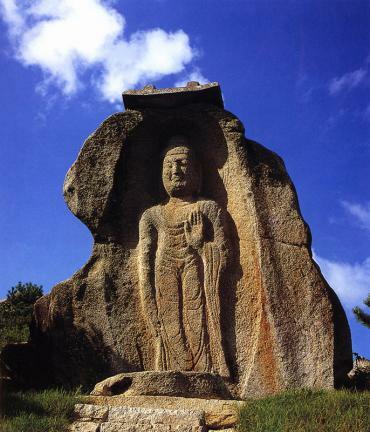 It is 4 meters in height and is located on Yongbongsan Mountain in Hongseong-gun, Chungcheongnam-do. 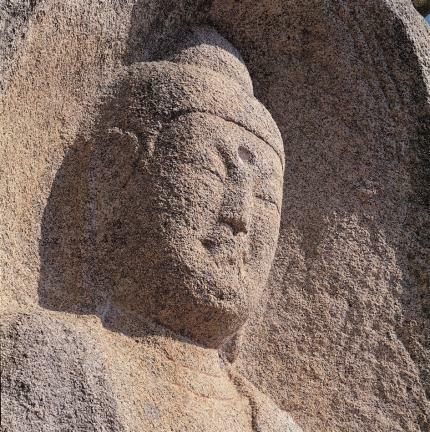 Overall, while the headpiece is solid and integrity is shown on the face, the statue is unbalanced by its loss of volume towards the bottom. 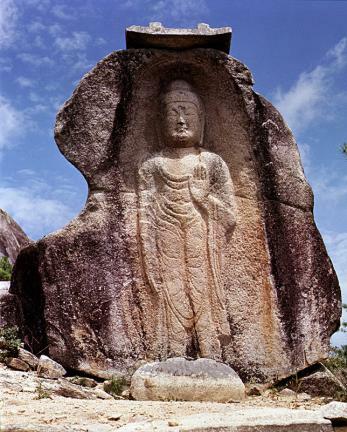 The usnisa (a protuberance symbolizing supreme wisdom), shaped like a topknot rising from the bald head, is fair-sized. The face is large and voluptuous compared to the body, and the calm smile gives an impression of mildness. The outer shape of the body falls away and becomes flat towards the bottom. The clothing wrapped around the shoulders is clearly depicted by several lines under the neck but the thin lines beneath that are rather like a graph. 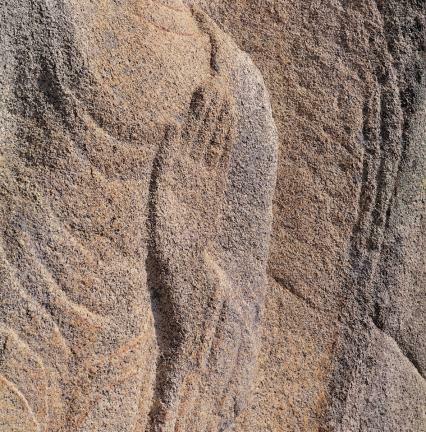 Only the outline of the mandorla (Buddhist halo of light), which gives shape to the light coming from the body, is expressed by an intaglio using the carved side of the rock. 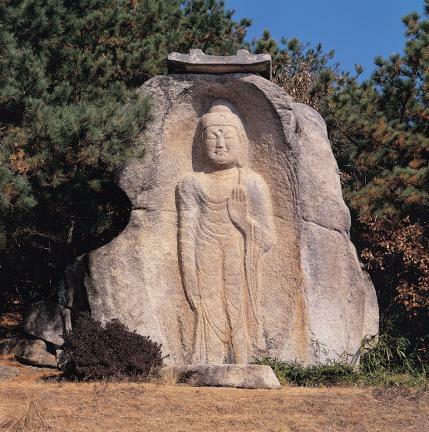 Though the face is plump and balanced, the graph-like ripples of the clothing and the unskilled carving techniques shown below indicate that this Buddha image dates from the early Goryeo Dynasty.